CinemaNow is no more, we take a look at some of the best free and paid alternatives. CinemaNow was an over-the-top streaming service that had tens of thousands of movies and TV shows in its library. Available in the US, Canada and the UK, it allowed users to pick and choose what they wanted to rent or buy in one-off purchases, providing an alternative to the monthly subscription services provided by the likes of Netflix and Hulu. Unfortunately, CinemaNow shut down in September 2017, leaving subscribers unable to access their previously purchased titles. Fortunately, there are plenty of free and paid alternatives to CinemaNow in 2018. It’s worth keeping in mind that many of these services have websites and apps that are geo-restricted, meaning they can only be accessed in select countries. Fortunately, a quality VPN can help you get around such problems. Let’s start with arguably the most obvious paid alternative to CinemaNow – Netflix. In contrast to CinemaNow, Netflix is a subscription service with plans available for $7.99 (basic), $10.99 (standard) and $13.99 (premium). However, you can try before you buy since Netflix offers a free 1-month trial. With a Netflix subscription, you can enjoy unlimited ad-free content as often as you want. Flexibility is also offered in that Netflix can be watched on almost any device and even cancelled at any time with no questions asked. One of the things Netflix does particularly well is that it suggests content (TV shows and movies) based on what you’ve watched and how you’ve rated it. This algorithm is clearly effective and provides a more personal experience in comparison to most streaming services on the market. What’s more Netflix also produces its own original content such as Stranger Things, Daredevil, Orange is the New Black and BoJack Horseman. Overall, Netflix is very well designed and we’ve rarely had problems when streaming videos, even in Ultra HD. The picture quality is almost always excellent and buffering and lag are rarely an issue with a respectable internet speed. Where Netflix is perhaps lacking is in the availability of current TV show episodes from cable and network TV channels. However, Netflix has over 125 million subscribers which suggests that people don’t mind this too much. You can watch Netflix on almost any internet-connected device including streaming media players, smart TVs, games consoles and Android and iOS smartphones and tablets. While Netflix is available in most countries, some content is geo-restricted and will require a VPN in order for you to watch it. Hulu is a video streaming service that is co-owned by The Walt Disney Company, 21st Century Fox, Comcast and AT&T. While Hulu does offer movies, its main focus is on offering newer TV shows as well as its own original content. Much like Netflix, Hulu is a subscription service with the option of a free one month trial. Plans start at $7.99 for basic access to the Hulu streaming library (with ads) and increase based on whether you select an ad-free plan, live TV, increased storage and recording options, or access via an unlimited number of devices. A subscription can also be cancelled at any time. How Hulu differs from Netflix is that it’s able to offer earlier access to newer TV series from other networks with episodes often available just days after being broadcast. What’s more, they have complete seasons of many TV shows. Some of the titles include Family Guy, Blackish and Saturday Night Live. Hulu also produce their own original content such as The Handmaid’s Tale and Castle Rock. Hulu has updated its interface in recent months and this has made it easier to use than ever before. Unfortunately, unlike Netflix and Amazon Prime Video, Hulu does not support 4K content as yet. Hulu is available on most devices including select smart TV models, Android and Apple mobile devices, streaming media players and games consoles. However, Hulu is only available in the US and Japan so you’ll need a VPN with servers in these locations in order to access Hulu’s content. A streaming service owned and operated by Amazon.com, Amazon Prime Video is a monthly subscription service much like Netflix and Hulu. A Prime Video subscription on its own costs $8.99 per month but there’s also the option of having Prime Monthly for $12.99 which includes the various Amazon.com perks including free same-day delivery and unlimited music streaming. Prime annual works out at $119 per year. As with Netflix and Hulu, Amazon does offer a free trial (in this case it’s for 30 days). Again, the service is cancellable at any time. Like CinemaNow, Amazon Prime Video lets you purchase and rent individual titles without having a Prime subscription. This is a nice option to have when you want to watch newer movies and TV series. Aside from licensed acquisitions, Prime Video also offers original content from Amazon Studios including The Man In the High Castle, Bosch and Transparent. As with Netflix, some of the content is available in 4K. Overall, we like the Amazon Prime Video apps but they’re not quite as intuitive as those of Netflix. 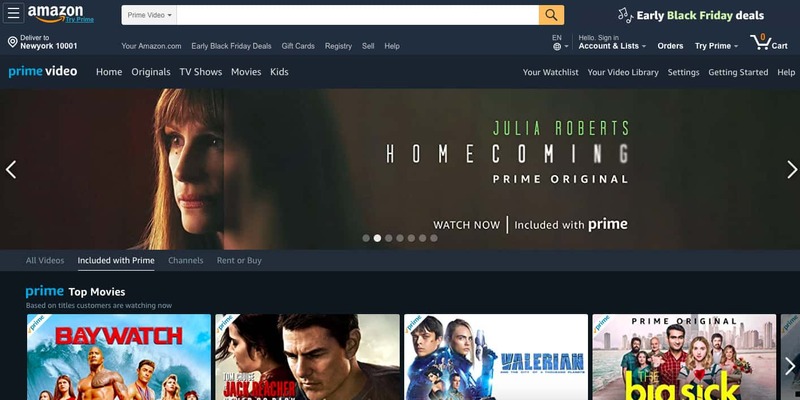 Amazon Prime Video can be accessed through a wide range of devices including smart TVs, set-top boxes, games consoles and Android and iOS phones and tablets. While Amazon Prime Video is available in most countries, some content is geo-restricted. However, a good VPN will help you get around any such restrictions. Not to be confused with HBO Go, which requires a cable TV package, HBO Now is a standalone subscription service. 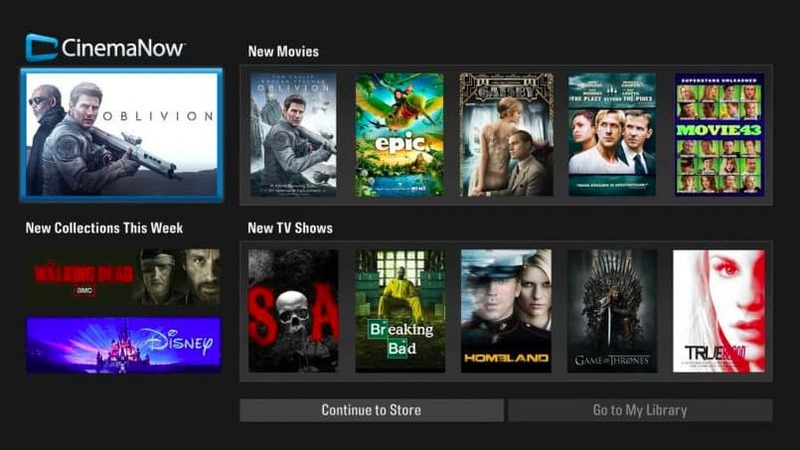 It lets you stream TV shows and movies online with no cable required. HBO Now has a wide selection of feature films including Dunkirk, Fargo and Murder on the Orient Express. However, it’s HBO’s award-winning original content that really makes it a contender as an alternative to CinemaNow with highly-acclaimed shows such as Game of Thrones, The Wire and Boardwalk Empire. An HBO Now subscription package costs $14.99 per month but there is an option of a one month free trial so you can try it out beforehand. It allows you to stream on multiple devices simultaneously and can be cancelled at any time, much like Netflix. The HBO Now app performs very well and streaming quality was very good with no buffering or lag. However, like Hulu, HBO Now does not support 4K content as yet. HBO Now is available on a wide range of devices including streaming players, select smart TVs, games consoles and mobile devices (Android and iOS). Note that HBO Now is only available in the US. You’ll therefore need a VPN in order to watch HBO Now outside the US. Popcornflix is a free online streaming service with a selection of movies and TV shows. It doesn’t require any sort of signup or subscription and makes its money from advertisements which are typically quite short (around 20 to 30 seconds) – you can even skip some of the ads after the first few seconds. As you’d expect, Popcornflix doesn’t have quite as much choice as many paid options and the overall selection is a little older. However, this is only a minor negative when it’s completely free. Some of the titles available on Popcornflix include Zodiac, The Adventures of Tintin, America’s Dumbest Criminals and The Girl with the Dragon Tattoo. Popcornflix also has a sister site called Popcornflix Kids. The Popcornflix website is simple to navigate with the option of exploring by genre. What’s most impressive is the HD quality of many videos and the fact that there was no issues with buffering. While registration isn’t required, signing up allows access to some interesting features such as being able to comment on particular moments of videos as well as creating gifs of your favourite scenes. Popcornflix offers apps for Android and iOS as well as Roku. You can also access Popcornflix on PlayStation, Xbox and Apple TV. Popcornflix is only available in the US and Canada but a VPN will help you access it abroad. Sony Crackle is a subsidiary of Sony Pictures Entertainment and offers free streaming of movies and TV shows. As such, you can expect to see some ads which tend to run before and during videos. At the time of writing, we’ve found over 200 movies available on Sony Crackle including Babel, Friends With Benefits and Jerry Maguire. However, there aren’t quite as many options when it comes to TV shows (there’s around 85) and often not all of the seasons or episodes of a show are available. Not only is Sony Crackle completely free, registration isn’t required. While we didn’t experience any problems with loading videos, the video quality isn’t the best and there’s no HD content. However, we like that the interface is user-friendly and that there’s the option of activating subtitles on videos. What’s more, Sony Crackle features some original shows, which is unusual for a free service. These include Chosen, StartUp and Comedians in Cars Getting Coffee. Crackle supports a wide range of devices including Android and iOS mobile devices, Smart TVs, streaming players and Playstation and Xbox games consoles. Crackle is only available in the US so you will need a VPN in order to access it abroad. Tubi is another US-based streaming service that lets users stream movies and TV shows for free. As far as free options go, this is one of the very best in terms of the sheer variety of content on offer. On Tubi you can find tens of thousands of movies and TV shows (and more added on a weekly basis) – all completely free with no signup necessary. Some of the options on Tubi include True Grit, School of Rock and The Adventures of Tintin. The TV shows aren’t quite as attractive but you can find the likes of South Park, Shameless and The Bridge. What’s particularly impressive about Tubi is the quality of the videos, which is excellent for a free service – many are available in HD. Users will also appreciate the library design which is not dissimilar to Netflix. Split into dozens of categories, it makes finding content even easier. Tubi’s content is ad-supported so you will see ads before and during content. However, in our experience ads were fairly short (usually 20-30 seconds a time) and generally didn’t interrupt our viewing too often. Tubi’s video player has a variety of options and lets you rewind, fast-forward, skip and go back by 30 seconds, add subtitles and more. Overall, the video player worked very well and we didn’t experience any buffering problems at all. Tubi can be accessed via many different devices including Android and iOS smartphones and tablets, streaming media players, select smart TVs and games consoles. Unfortunately, Tubi is only available in the US so if you’re outside the US, you’ll need a VPN in order to access the content. Operated by Yahoo! In partnership with Hulu, Yahoo View is a free service offering streaming TV shows and movies. One of its main selling points is that it streams recent episodes of TV shows from ABC, NBC and Fox. TV shows available include Brooklyn Nine-Nine, Empire, Gotham and Shark Tank. However, it’s worth knowing that only the last 4 episodes of a show are available in many cases. 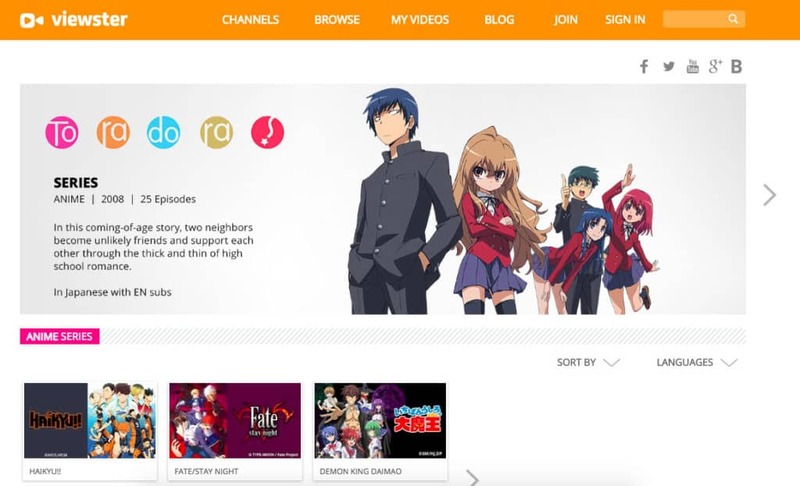 Exceptions to this include some of the international dramas on offer as well as anime, both of which have some shows with full seasons available. The selection of movies is not quite as impressive with few mainstream options on offer. As you’d expect for a free service, Yahoo View is ad-supported and these ads can be quite frequent. Quality of streaming is reasonable with quick playback and minimal buffering. The video player is the same as that of Hulu and the interface is simple and intuitive. We also like that there’s the option to not only add but customise subtitles. Underneath each title is an interesting ‘fan zone’ section which has information on cast members, relevant gifs from Tumblr and extra clips such as deleted scenes. There aren’t many apps available for Yahoo View so you’ll likely have to make do with watching via web browser. Unfortunately, Yahoo View is only available in the USA so a quality VPN is needed in order to get around these geo-restrictions. Most people use YouTube and watch free videos on a regular basis but many don’t realise or haven’t considered YouTube an alternative to CinemaNow. We feel it’s a legitimate contender since it offers a wide selection of movies and TV shows which are available for purchase as well as rent. Many of these are new titles that are currently or have recently been on TV or in the cinema. Titles include Game of Thrones, Doctor Who, Incredibles 2 and Hacksaw Ridge. Rental and purchase rates vary from $2.99 to $19.99. Rentals are available for 24 or 48 hours once you hit the play button, depending on the title in question. Those familiar with the YouTube platform will know it’s possible to watch videos in SD, HD and even 4K in some cases and this is much the same with YouTube’s paid content. One of the benefits that YouTube provides is in some of the bonus extras you can get with a movie purchase with cast interviews and so on. One of the best things is that YouTube is available almost anywhere and on most devices and it’s very easy to use. YouTube apps are available for almost every internet-connected device including streaming media players, Android and iOS, consoles, Apple TV and more. Some YouTube videos can be geo-restricted but this can be solved with the use of a good VPN. Offering ad-supported movies and TV shows, Viewster is another good option since it’s free and doesn’t require registration. It has an extensive library of more than 12,000 titles. Unfortunately, it doesn’t offer the kind of quality that CinemaNow used to provide with few mainstream movies and TV shows available. However, Anime fans may enjoy Viewster thanks to the wide range of anime series on offer. Video quality on Viewster varies drastically with some videos available in 720p HD and others uploaded in fairly low quality. Browsing videos is easy thanks to the user-friendly design. It’s possible to browse not only by genre but date added and most viewed. The video player is simple with few options available. Performance was respectable with relatively quick video loading. You will come across some ads and these can be as long as one minute, which is a little lengthier than many other streaming sites. There’s a Viewster mobile app available for Android and iOS as well as select smart TVs. While Viewster is available in most countries, you may wish to install a trusted VPN in case you come across geo-restrictions on videos. Apple’s iTunes is similar to CinemaNow in that you can pay per title rather than have a monthly subscription. Such an option may prove to be less expensive if you’re not watching content on a regular basis. iTunes has a wide selection of movies and TV shows on offer and users have the option of renting or buying (however the rent option isn’t available for TV shows). We found movie rental prices from $0.99 to $5.99 while outright purchase varied between $4.99 and $14.99 (though box sets obviously cost more). TV show episodes can be bought for from $0.99 to $2.99 but there’s also the option of buying a season pass in many cases. We were pretty impressed with the selection of content on offer with mainstream movies including Incredibles 2, Jurassic World: Fallen Kingdom and Mile 22. TV shows on offer include Doctor Who, The Walking Dead and Game of Thrones. 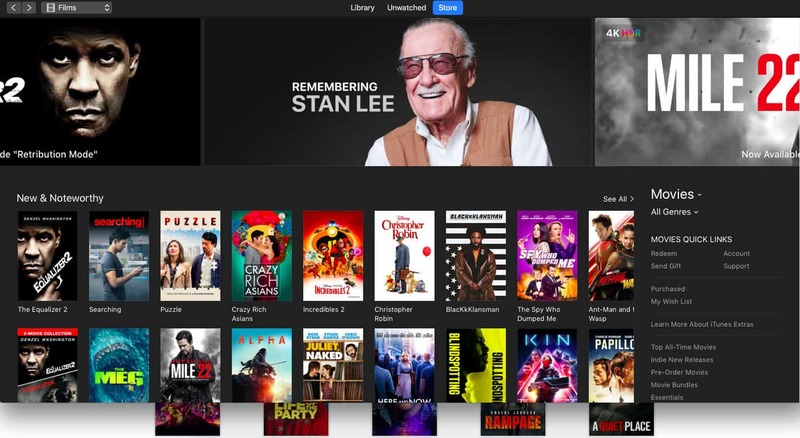 The iTunes interface is well presented with plenty of options when it comes to browsing titles (you can search by genre, new releases and price, etc). You can also find descriptions, reviews and trailers for different titles. However, we did find the app to be a little slow at times. The choice of apps and devices is somewhat limited with iTunes. Users can only realistically expect to use iTunes with Apple devices and Windows computers – it’s not available for smart TVs or Android devices. While iTunes is available around the world, some content is geo-restricted which means you’ll need a VPN in order to view it. Google Play allows you to buy and rent movies and TV shows much like YouTube and iTunes. What’s particularly interesting is that title purchases on Google Play will be available in your YouTube library and vice versa. Google Play offers a wide range of titles both old and new. Some of these include Game of Thrones, The Big Bang Theory, Deadpool 2 and Avatar. Prices vary by title but we generally found movie rental prices from $0.99 to $4.99 and outright purchase from $5.99 to $19.99 for 4K content. Most TV show episodes we found could be bought for $1.99 but you also have the option of buying full seasons. Google Play is very user-friendly and makes browsing movies and TV shows very simple. It’s a nice touch that each title has accompanying information about the cast, run time and also features trailers and reviews from users. Rented titles are available to start for 30 days but this typically becomes 48 hours when you click the play button (again, it varies by title). Overall, Google Play is a good option for those who watch movies and TV shows only infrequently. If you do so on a daily basis, a subscription model might better suit your needs. Google Play content can be watched on streaming media players, smart TVs and Android and iOS devices. Google Play is available in many countries worldwide but you may find some content that is geo-restricted. You’ll therefore need a good VPN in order to get past such restrictions.